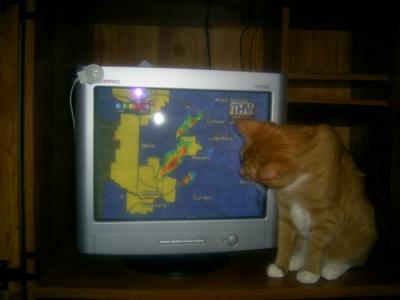 Im watching for severe weather in Arkansas! Hi my name is Cheeto. I get very nervous and jittery when we have bad weather in Arkansas. So when the weather gets to being bad I get on the Internet and tune in to the local television weather radars to find out when and where the severe weather is. I sit and watch and when it gets close to home I run and hide. Oh yeah, but first I tell my owners whats going on so they can get in the storm cellar and hope they don't forget me on the way out. Anyways thats my story and I hope you enjoyed it. The cat does seem to be watching the screen.